After you vote, you can check out my profile page which includes my newest interview with YNOT HERE. I talk with them about a variety of topics, including talking about all of you, so I hope you give it a look because maybe you will find out a few new things about me You can also click the picture below to see the interview. This entry was posted in News on September 10, 2018 by Ophelia Marcus. Prague 2017 Recap, off to TES Prague 2018! I am so happy and excited to being making my third trip to beautiful Prague for The European Summit! Although there is a lot of business going on, and its always such a great and well prepared and organized event, I always have a lot of fun there and I never get tired of exploring the streets of such an amazing city! By the way, I will be speaking on two panels this year, “Women in Dating and Adult Businesses” and “When to Hire an Outside Firm to Help your In House Team,” so if you are in the industry and will be at the TES, stop by, give a listen and say hi! Last year in Prague I was so honored to co-host the YNOT Awards with my good friend Jay. I had a lot of fun preparing for it and doing the show. You can watch the video above to see how the evening went, before, during and after the show! And for those who haven’t had a chance to visit Prague, below is a little video of me exploring the streets at night. It was a bit chilly out, but the city was so still and cozy with gorgeous views everywhere. It was quite a change from the hectic and crowded Old Town area. I hope you enjoy it and I look forward to sharing more memories and moments from there soon! So please take some time and really use your fingers to scroll through the ARTICLE (Or click the picture Above) and fill up your eyes with all you can handle of me. This entry was posted in News on July 17, 2018 by Ophelia Marcus. This article is something I wasn’t expecting and is a wonderful surprise to me. It is a huge, huge, HUGE honor to be listed among some of the best influencers among the adult webcam industry. Especially when I know so many of these amazing people which i have so much respect for and with many of them I consider to be my friends. I am at number 13, which is a nice lucky number right in the middle of things, where is where I usually like to be! I am also very thankful to Bender Cain for posting about my Academy in the article too! TWO YNOT AWARDS Voting and Nominations Open! Even though both awards are from YNOT, make sure you read both explanations below so you know if you are eligible to vote for the Prague awards (Industry Members), Hollywood awards (Open to all) or both. I’m especially honored for being recognized as a representative for models in the industry which means a lot to me! The nominations are from people in the industry and I’ve worked very hard since 2014 to be a great representative, not just among my peers and others in the industry, but in the media and reaching out into mainstream opportunities to show a good face of what we do and break down misconceptions of our industry. Not only have I been published in dozens of articles I’ve worked hard to take part in projects and events in both the adult and mainstream industry. So you know what to do! If you are a member of the industry you can vote for me HERE to login (or register if you haven’t already) and click the circle next to my name in both categories. You can also click on the white banner to the right for the YNOT Awards Prague. I’m really excited to see not only a new award show in the US, but some new and unique categories being available geared towards all kinds of different cam models. So to nominate me for the YNOT Cam Awards in Hollywood, you can go HERE and click on “Suggest Nominee” or click on the black banner to the right! I’m excited to have a new cam awards show here in the US! I’m really looking forward to it! Thank you so much again, I am so honored and humbled to be nominated by the people in the webcam industry, it is a real honor! LittleRedBunny, one of the most awarded and recognized cam models in the adult industry, will be making her first official trip to Romania under the banner of her LittleRedBunny Academy in May and June of this year. Her Academy, which officially launched at LALExpo in Cali, Colombia in July 2017, offers unique and tailored services for studios and models to improve performance, productivity and motivation. LittleRedBunny’s Academy takes her more than nine years of camming experience, knowledge of platform operations, strong work ethic and her psychological approach to bring a unique and proven method to coaching studios and cam models. Indications so far from those who have taken part in the Academy have been very optimistic, a trend LittleRedBunny wants to continue on her upcoming trip to Romania. Studios who are interested in booking LittleRedBunny for a visit, consultation, or any of her Academy services should contact LittleRedAcademyPR@gmail for more details and availability of her schedule. This entry was posted in News on April 12, 2018 by Ophelia Marcus. My 9th Bunnyversary is Here! I can’t believe it’s been almost a full decade online! It seems like I just started yesterday. This has been a really amazing journey and experience, with so many things happening I never dreamed of! The most important thing during all this time is having the pleasure to meet so many wonderful, smart, funny, caring and crazy (the good kind of crazy) people in my little online speakeasy of a room (and some in person at events). All of you unique and special people really made these last 9 years go by so fast because you all made this journey so fun, exciting and meaningful that I never noticed the time pass. I can’t thank you all enough for being a part of my life, and making my life a part of yours. You all mean so much to me that I can’t simply put it in words. And even if I could, I would probably get tongue tied and say it wrong anyway! Hahaha! So THANK YOU FROM THE BOTTOM OF MY HEART (and from my bottom too)! I LOVE YOU ALL so much! This entry was posted in News on April 7, 2018 by Ophelia Marcus. Two Romanian Award Shows FINAL VOTING! Thank you so much for getting me into the final round of voting in four categories for the AW Awards! There will now be a daily vote through May 15 so please make sure you keep up your support a little bit longer! AND YOU CAN VOTE DAILY! I have my very own link for you to vote on all the categories I’m nominated in to make it easier for you. Just click the picture above or HERE to go vote for me. After you nominate me, you can post to Twitter that you voted so I can thank you personally! Just make sure you add @littleredbunnyx on the tweet so I can see it. 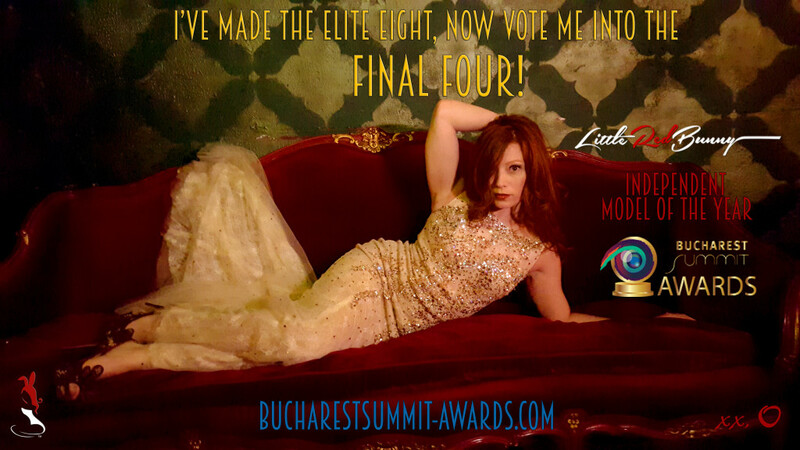 I’m also still nominated for the Bucharest Summit Awards Independent Model of the Year, which I won the inaugural award last year. Let’s go for two in a row! I’m in the Elite Eight now, and you can help get me into the Final Four where the winner will be voted on LIVE at the Awards Show! Boop boop! You can click HERE or the picture above to vote me. I know it’s getting cliche to finish these posts with a thank you to everyone, and how much you mean to me. Seems like I say this many times a year. But to be honest, I can never say it enough and never express enough just how much you all mean to me. It’s not an exaggeration how important and special you all are to me, and that will never change. So I hope you get used to me saying this over and over and over again! Hehehe! So thank you all again. I wish I could give you all great big hugs right now! This entry was posted in News on March 20, 2018 by Ophelia Marcus. New TES & Live Cam Awards destination: PORTUGAL! It may be that time of year again (again), but this time when I go to The European Summit and Live Cam Awards, it won’t be in Sitges, Catalan in Spain, it will be in Cascais, Portugal. Even though I am excited to travel to a destination I’ve never been to before, I’m still very sad not to be going back to a city I’ve grown to love over the last three years. Sitges is such a beautiful, tranquil place, filled with wonderful restaurants, and more importantly, wonderful, friendly and unforgettable people! Plus, it was also the first place in Europe I had even been, so it is another reason to have a special place in my heart. So before I go, I have two videos recapping last year’s trip (A third video wasn’t quite finished before I have to leave, so I will post it when I get back home). The videos not only show some of the things I do for work, socializing and play, but its also a little bit of a love letter to Sitges and all the good times I had there. I hope I get to travel there again sometime soon in the future! No post before I leave on a trip would be complete without me thanking all of you for making these trips possible. This year at the Live Cam Awards, I’m nominated in FOUR categories, and you can still vote for me through March 1 HERE on by clicking the banner to the right! As I try to expand and grow in the industry, your support, friendship, company and laughter has really helped me keep striving to be the best I can be and makes me so proud of the work I do, especially because of having so many amazing friends and fans around me. I love you all so much! So enjoy the videos while I’m away. Don’t forget to follow me on Twitter, Facebook and Instagram for updates from my travels (mostly Twitter! ), and as always, be good while I’m gone so we can be bad when I get back! This entry was posted in News on February 26, 2018 by Ophelia Marcus. LittleRedAcademy Page is now LIVE! It’s finally here! I have officially launched my LittleRedAcademy page! So if you are a cam model, studio, or interested in becoming a model or start a studio, all the information you need to get personal mentoring and consulting by me is just a click away! 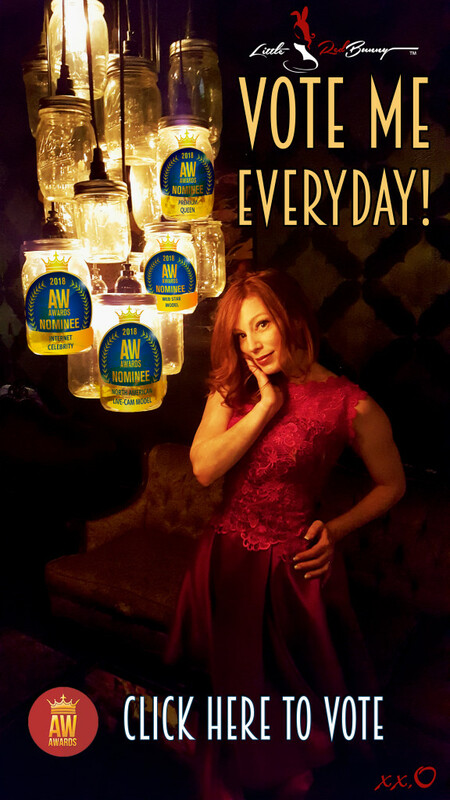 You can either click on the LittleRedAcademy tab above, the banner on the right (if you are seeing this on the main page feed) or click HERE for more information on how you can succeed in the camming industry! This entry was posted in News on February 9, 2018 by Ophelia Marcus. Click the pic to NOMINATE ME! Two Romanian Award Shows Open Nominations! David Billings on 10th BUNNYVERSARY CELEBRATION!!! David Billings on Two Romanian Award Shows Open Nominations! David Billings on VOTE ME FOR LIVECAMAWARDS! !